Wishful is made from a fuzzy white material covered in pink, blue and green patches. She has a fluffy purple mane and tail and the inside of her ears and hooves are glittery purple. 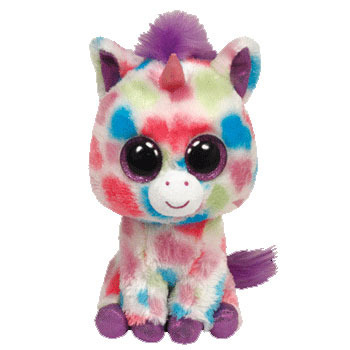 She has large, sparkly purple and black button eyes and a glittery pink horn on her forehead. Is giving wishes with my magical horn! Wishful the Unicorn was introduced on 1st January 2013. This is the regular 6″ version of Wishful. She was also released as a larger 9″ Beanie Boo Buddy, in an even larger 16″ size and as a keyclip.